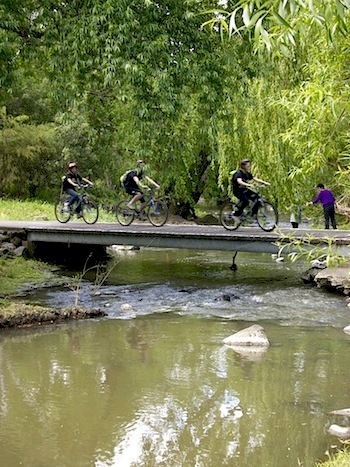 Along the Merri Creek Path you can ride or walk through Melbourne's inner north without ever crossing a road. 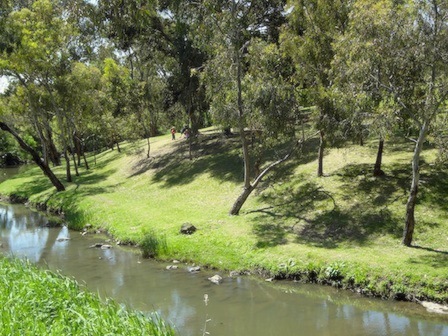 It is one of the nicer Melbourne bike paths, winding and skipping from one side of the Merri Creek bank to the other, all the way to the Yarra. 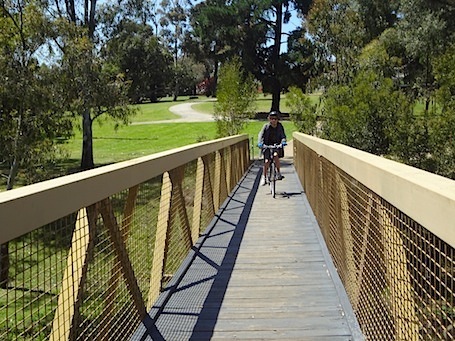 The bike path at its northern sections takes you past new housing estates, garden plots, a few horse paddocks and sports ovals. South of Coburg, the valley has been cleaned up and replanted, and has become an attractive parkland and reserve - though with high voltage power lines following you a while. The path is sealed most of the way, except north of Coburg. 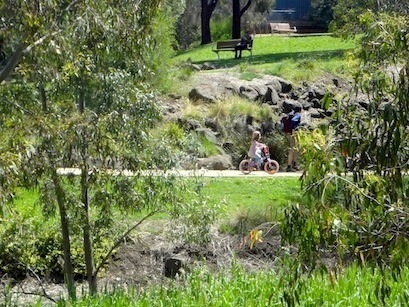 It is popular and can get quite busy on weekends with prams, dogs, bikes, kids and serious bike riders winding through. 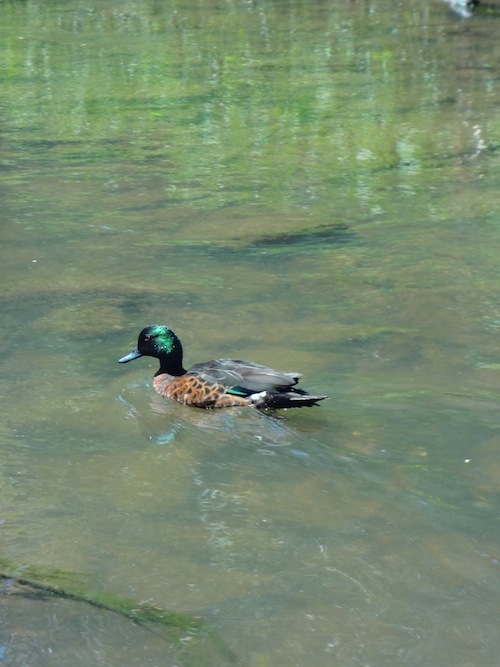 With a number of popular and scenic picnic spots on the way and being next to water, it has a special attraction! 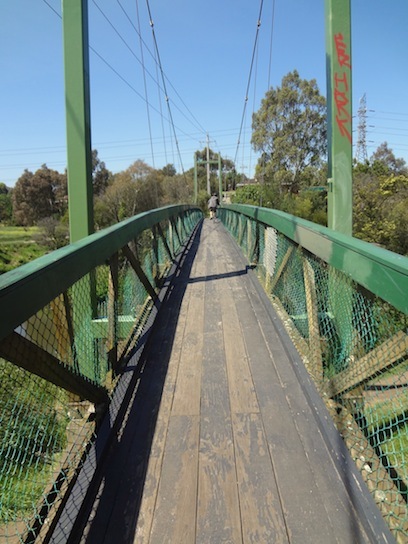 The bike path from the Ringroad to the Yarra is 19km long. North of Coburg, there are great open spaces - some good areas for flying a kite. This part of the path is typical of industrial land that is being gradually reclaimed by the sprawl of the city - with nature unkempt (but not unattractive) growing its way back from having been abused and raided by 20th century 'progress'. 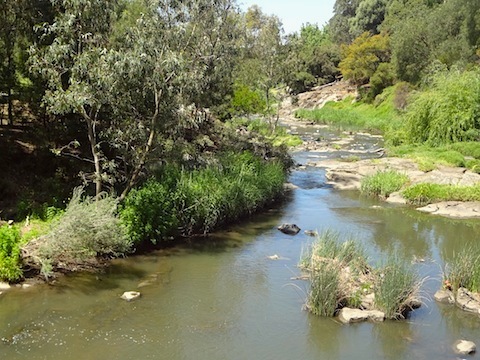 The Merri Creek Trail becomes lush and green there, lined by weeping willows and grass lands, dotted with picnic rugs, lazing people and the smells of Sunday BBQs. It continues southwards to be picturesque with crossing bridges and meadows. Just after Normanby Avenue is the Brunswick Velodrome, a track cycling ring you can test your track cycling skills on. 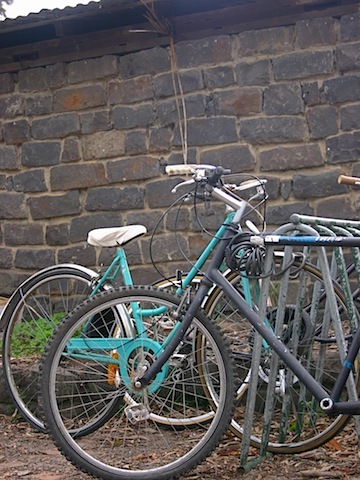 It is home to the Brunswick Cycling Club. 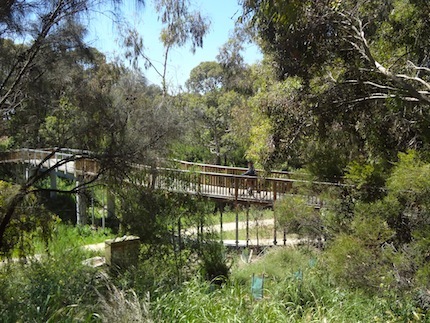 A bit further on is the CERES environmental park, a real highlight on the Merri Creek trail. 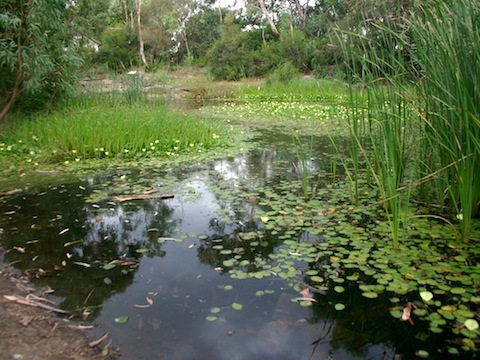 Life there is like in the good old times (except for the power lines) - with roaming chooks, a dam with frogs, quirky garden plots and weekend gardeners. It has a good coffee shop and is a great place to hang out. There is also a cute nursery, a bike shed where you can fix or build your bike, windmills and energy efficient buildings and an energy education centre. 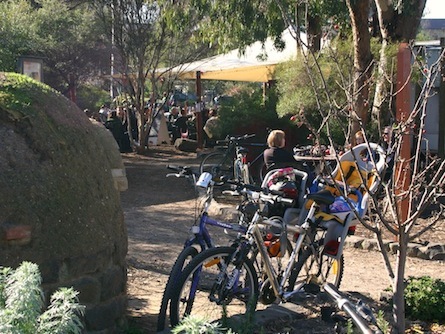 The path then trails North Fitzroy, where you can always find good coffee, and then joins the Capital City Trail at Rushall Station. After that on are some low crossing bridges until you hit a very steep hill just past Heidelberg Road. 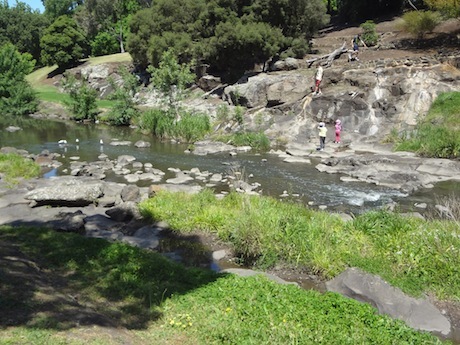 From then on the Merri Creek Path continues on its high bank alongside Clifton Hill. Cross the creek one more time before you get to Dights falls where the Merri Creek merges into the Yarra - and the Merri Creek Trail into the Main Yarra Trail. 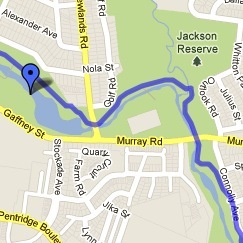 Here is a Google map of the Merri Creek path. 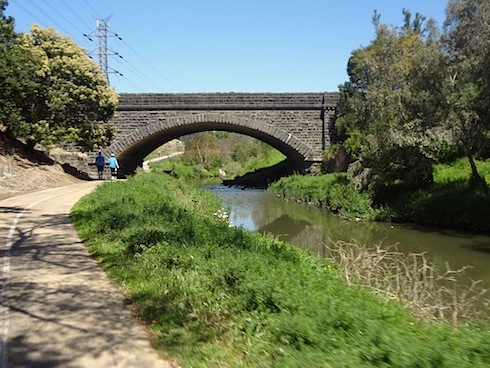 You can start on the Merri Creek Trail anywhere along the way, in Fawkner, Coburg, Brunswick, Fitzroy North or Clifton Hill. The trail is easy to follow - just follow the creek - you really cannot get lost. 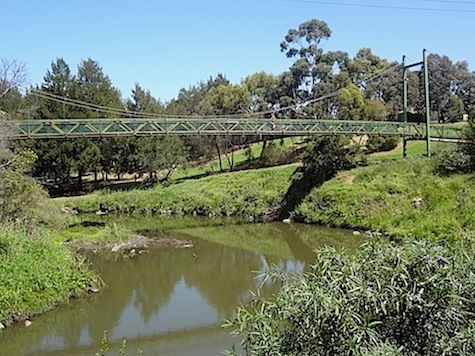 If you'd like to ride it one way, you can take a train to Batman and cut across to Coburg Lake, or take a train to Rushall Station, from which you can ride either way along the creek path. The creek is prone to flooding after heavy rains and turns into a fast flowing river. 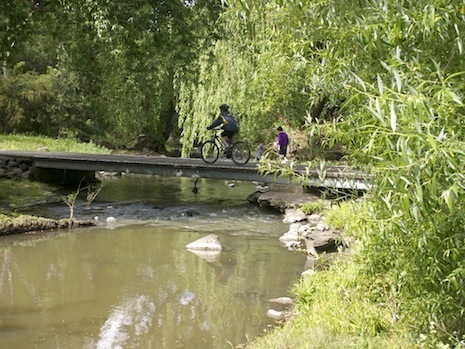 As the Merri Creek Path follows the creek closely under the road crossings, it becomes impassable at various sections and undercrossing a few times a year. Make sure to follow the signs and the detours at those times. 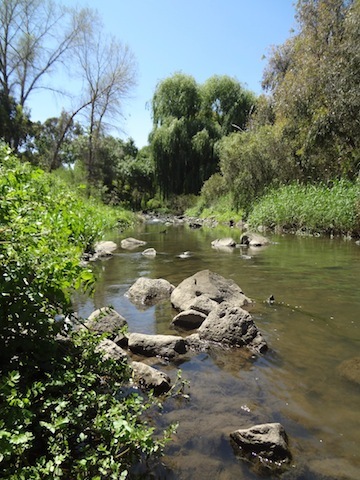 Enjoy our photo gallery of the Merri Creek Trail.